Castor oil is a vegetable pressed oil derived from castor seeds which grow in Ricinus communis, a flowering species of the spurge family, Euphorbiaceae. Castor is a native plant of India and eastern Africa where castor oil is produced in large quantities. Castor oil is used in a wide variety of applications. The major use of castor oil is found in the industrial application where it is used for the production of paints, soap, cosmetics, varnishes, adhesives, lubricants etc. Castor oil is also used for the production of castor oil derivatives which again are valuable chemicals used for industrial application. The Asia Pacific region is estimated to contribute around 46.7% value share as it is the major consumer of castor oil in the world. Owing to the supply chain system and versatility in castor oil applications in the region, the demand for the castor oil is expected to grow significantly. Production of hydrogenated castor oil has played a very crucial role in the cosmetic and chemical industry. The purpose of hydrogenation of castor oil is not only to improve the keeping qualities, taste and odor of the castor oil but also to raise the melting point of the oil. On the other hand, the use of Jamaican black castor oil has witnessed an upsurge in sales, owing to its unadulterated method of processing and its antifungal and antibacterial properties. Key players of castor oil market are anticipating strong performance in the Latin America castor oil market. Several manufacturers of castor oil are entering new markets through the acquisition of major regional players of castor oil, in order to enhance their product offerings and manufacturing facilities for castor oil. Moreover, companies are currently focusing on opening new innovation centers for castor oil in order to expand and boost their regional presence accordingly. Innovation and advancement to create a superior product from castor oil have been a vital strategy implementation by major companies. Companies in the castor oil market are investing significantly in research & development to gain competitive advantage and create novel applications. Gujarat is a small geographic region in India, where the global production of global castor oil is concentered. Factors such as subtropical climate conditions and labour-intensive cultivation methods are favouring the cultivation of castor seed and castor oil, which either way becomes a challenge for castor processors in the U.S. and Latin America. Approximately 73% of the castor oil produced in India is concentrated in Gujarat itself. According to data published by the Government of Gujarat, castor seed production in India increased by almost 10% to reach 1.5 million tonnes for the year 2016-17, which clearly signifies the fact that, the availability of castor seeds is in copious, resulting in large production of castor oil, which is anticipated to boost the overall growth of the castor oil market, globally. Being a clean-burning, biodegradable, and renewable fuel, the demand for biodiesel is increasing across the globe as a better replacement for petroleum or diesel. A majority of governments are encouraging the use of biodiesel as a substitute for conventional, air-polluting fuels such as petroleum and diesel. Owing to its ease of use, environmental benefits, increasing power generation applications, and government subsidies on biodiesel, the consumption and requirements of biodiesels have grown substantially across the globe. Biodiesel is produced by converting animal fats or castor oil into fatty acid methyl esters or FAME. FAME is referred to as biodiesel when it is used as a source of fuel in various applications. Due to a wide range of benefits and applications of biodiesel, its production and distribution has increased extensively, which will augment the demand for castor oil in the near future. Castor oil is used in a number of industry applications, and is also considered to be one of the most promising non-edible oils in the world. Castor oil is used as a raw material for the production of a wide variety of products. Castor oil is majorly used in the chemical industry for the formulations of bio plastics, surfactants, polymers, plasticizers, and specialty rubbers. The application of castor oil is not only limited to the above-mentioned products, but also used for making hydraulics and brake fluids, and developing low-point lubricants for cold weather conditions. Moreover, the by products produced during the production of castor oil are also used as fertilizers in a smaller scale for substantial plant growth, and it is anticipated that, with time, the use of these by products will increase to a larger level. All such wide applications in the chemical, cosmetic, and personal care industries are increasing the demand for castor oil, which is expected to drive revenue growth of the global castor oil market over the forecast period. The proposed market report of TMR on the global castor oil market evaluates opportunities in the current market, and provides updates and insights corresponding to different segments involved in the global castor oil market over the forecast period 2018–2027. The global castor oil market report further exhibits the estimated data for 2018, and forecast data up to 2027 in terms of value (US$ Mn) and volume (MT). In terms of value, the castor oil market is anticipated to increase at a CAGR of 3.0% during the forecast period. The present study exhibits the trends and market dynamics of the castor oil market in five major regions - North America, Latin America, Europe, Asia Pacific, and the Middle East and Africa. The report also includes the study of current issues with consumers and various future opportunities for the Castor Oil market. The report explores the global castor oil market for the period 2018–2027. The primary objective of the report is to provide insights into key developments in the market that are consistently supporting the transformation of global businesses that are associated with castor oil. It is very important to consider that, in an ever wavering economy, we provide the estimated (Y-o-Y) year-on-year growth rate in addition to the Compound Annual Growth Rate (CAGR) for the overall forecast, to better understand the analysis and evaluation of the global Castor Oil market, and to discover equitable opportunities. Yet another key feature of this report is that, the estimation of the global castor oil market and the corresponding revenue forecast is carried out in terms of absolute dollar opportunity. This is usually not prioritized while forecasting overall market numbers. Absolute dollar opportunity analysis is very essential in evaluating the degree of opportunity that a provider can observe to execute, as well as to contrast the potential resources from a sales perspective in the global castor oil market. The report starts with an elaborated executive summary, and the market definition of various segmentations that are included and their respective shares in the global castor oil market. The report further incorporates the major macroeconomic factors that have an effect over the growth of the castor oil market. The report also highlights the various market dynamics, which includes the drivers, restraints, opportunities, and trends in the global castor oil market. The report further underlines the study of the present issues with industrial processing, and opportunities for the castor oil market. It also encompasses value chain analysis that provides a structural view of overall profitability from the manufacturer to the end user of the castor oil market. 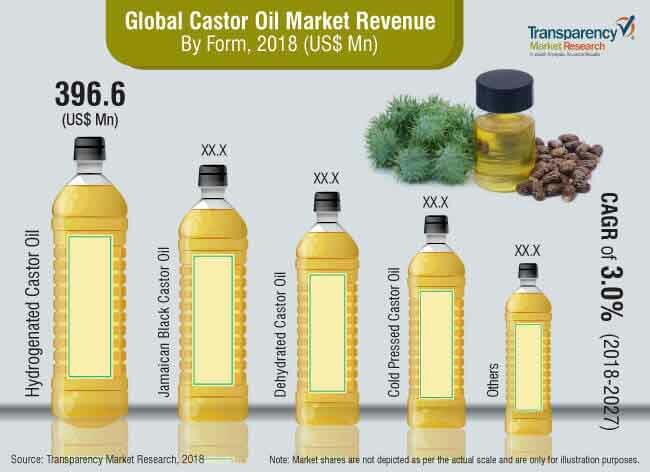 In order to provide users with a clear view of the global castor oil market, we have exhibited the competitive analysis of key market players and their strategic expansions. The competitive dashboard presents a detailed comparison of castor oil manufacturers on valuable parameters such as key product offerings, total revenue, key developments, and key strategies. The study intensifies the global castor oil market attractiveness analysis by product type, end use and region. To evaluate the overall market size of castor oil, the report considers various fundamental aspects based on secondary research. Furthermore, it emphasizes quantitative evaluation such as market shares by product type, end use and region, and other qualitative data from primary respondents, which have been consolidated to arrive at clear and accurate market estimations. The forecast presented in the castor oil market report arrives at the total revenue being generated, and expected revenue contribution in the future by the global castor oil market. The detailed profiles of companies that manufacture castor oil are included in the report to analyze their developmental strategies, key product offerings, and recent developments, as they have a significant role in the global castor oil market. Major market players covered in the castor oil market report are Adani Wilmar Limited, The Chemical Company, Arvalli Castor Derivatives Pvt Ltd., Girnar Industries, Sunny Isle, Sree Rayalaseema Alkalies & Chemical Ltd., Adya Oils & Chemicals Ltd., R.P.K. Agrotech Exports Pvt. Ltd., Cockney Finestyle, LLC, Tongliao Tonghua Castor Chemical Co., Ltd., Purerzan Jamaica, BDI Enterprises, LLC, Thai Castor Oil Industries Company Limited, Jayant Agro-Organics Limited, Gokul Overseas, Itoh Oil Chemicals Co., Ltd., Hokoku Corporation, N K Proteins Pvt Ltd., Shavuot Farms and Amee Castor & Derivatives Ltd. among others.